Student Records Requests made easy! No more paper forms, cash handling, long lines, illegible faxes, full voicemail boxes... just happy alumni and happy records administrators. 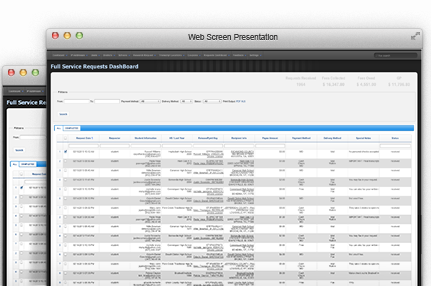 The fast, easy and secure Online Student Records Request and Education Verification System. 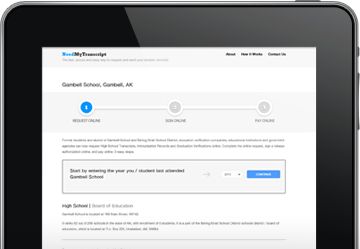 NeedMyTranscript is the leading cloud-based student records request and order processing system designed specifically for High Schools and Districts. It automates and simplifies every step of the student records request process, from online ordering, signed releases, payments and ID verification to order tracking, processing, reporting, accounting and archiving. 1 Your alumni will thank you for allowing them to request their records online and providing them with great service. 2 Your records custodians and counselors will thank you for making it so much easier to process and track requests. 3 Your finance department will thank you for the bringing in more fees to the school or district. 4 Your legal department will thank you for eliminating the risk of a FERPA violation. 5 Your alumni association will thank you for helping them reconnect with so many alumni. This module is specifically designed to facilitate every aspect of the transcript request process for your alumni requestors and your records processors. Your alumni expect online convenience and immediate service. Give them what they want while simplifying your workload. Education verifications have become a standard practice in pre-employment screening. Make sure your school or district is getting properly compensated for providing this service, while simplifying the process for your records administrators, and protecting the privacy rights of your students. This module is specifically designed to handle requests from education verification companies, corporate entities, and other authorized 3rd parties requesting aspects of a former student's record. What type of Training and Support do we get? How does the school / district collect fees? How does NeedMyTranscript make money? What Type of Data Security do You Have? No, we do not require a contact. We are easy. All we ask is that you put the NeedMyTranscript link on your site, direct users to the system, and let us help you if you ever have any issues. You can stop using the system at any time, no notice, no reason required. No. NO Software or equipment is needed. The technology platform is 100% cloud-based, fully managed and hosted in secured FERPA compliant environment. This means that no software is required, and all data management, firewall and software maintenance and back-ups are handled as part of our service. This includes the order processing system, the payment processing system, and signed document archive. The only thing you need is access to the internet from any major browser (Internet Explorer, Firefox, Chrome, Safari) and a valid user name and password. Configuring and activating is simple, and can be done in matter of minutes. We work with your team to define your document processing fees, email messages, logos, colors, verbiage for your landing page and that's it. Your system is configured and ready to go. Once we configure your system, our team will train your records processing staff and be by their side to process the first wave of orders. Our Support team is available 24 hours M-F to assist with any technical issues or questions. We mail you a check (or ACH) every month, with an itemized list of all transactions and fees collected. We are compliant with all security features as mandated by FERPA, and most Business Associate Agreements. The following are just some of the security features we have in place to secure protected student data. Emergency Access / Disaster Recovery: All data is backed up daily, weekly and monthly to a secure storage appliance where emergency access can be granted in minimal time. User Passwords: The system requires high password complexity and minimum password length. In addition, secure hash values (a uni- directional cryptographic value) are transmitted from the browser to the service provider. Passwords are stored in hash-value format. Account Lock-Out Policies: The system automatically locks out users after a specified number of invalid sign-in attempts. This virtually eliminates the possibility of data compromise as a result of brute-force attack. SSL: A secure socket layer (SSL) is utilized for all communication between the customer browser and the hosted application. Session Timeout: User sessions automatically time-out based on defined settings. The same technology platform that has been used by thousands of students and agencies to student records from over 15,000 high schools, in all 50 states, is now FREE to all high schools and districts. Request a simulation site today and see what your alumni and records administrators will experience first hand! Love it! Can we set up a "live simulation" site so we can see what our alumni and records administrators will experience first hand? Don't worry, its only a test site, so it won't actually process real orders, but it is still a cool way to see how it works! Are there any special instructions the requestor must follow? Eg. Copy of ID, SSN, Notary, provide pre-addressed envelopes. I'm "old School", can i talk to someone first? Sure, just give us a call. One of our transcript specialists would love to talk to you. Our support centre is located in Charlotte,North Carolina. If you are a records admistrator from an educational institution, and would to learn more about our services, please email us at: solutions@needmytranscript.com.